A few years back, the cooler was considered high-quality, if it can keep the ice for the entire week. At present, premium coolers have increased the ice lifespan to ten days. But these coolers are not cheap at all. So it is essential that you choose the best cooler that is worth your money. When it comes to cooler, Pelican is the brand of choice. You might be wondering why. 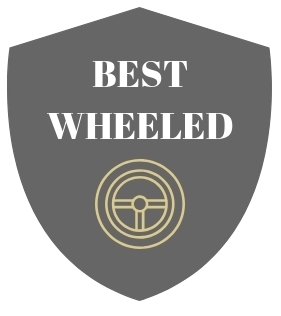 The brand is very durable, and their list of features are amazing. Before you buy one, check out our Pelican cooler reviews first. To make it easier for you to choose, we have included a list of pros and cons of each compared model. Pelican vs. Yeti - Which Brand Provides the Best Coolers? Pelican ProGear Elite Cooler is an American made durable cooler that can keep ice frozen for seven to ten days. Although it may sound impossible, a lot of users have testified that it keeps their ice frozen for longer days even in hot temperature. This Pelican cooler is recommended for a day outside. Perfect for tailgating, backyard cookouts, fishing, a weekend camping trip, boating, food transportation and a lot more. It has press and pull latches that are secured firmly so you can hold latches tightly even under pressure. ProGear Elite 45 Quart has a built-in bottle opener to keep the content secured because of its molded-in lock hasp. 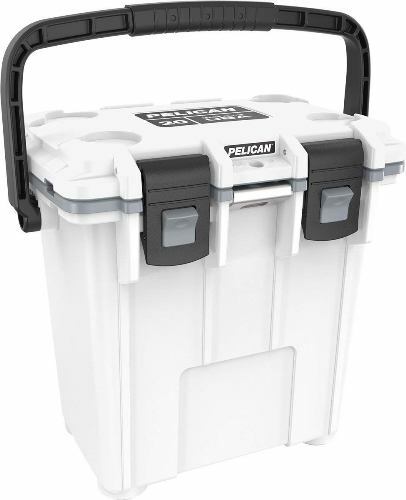 Exterior 29.66" x 20.00" x 19.25"
Interior: 19.00" x 12.00" x 12.00"
This Pelican 80 Quart Wheeled Cooler has a lot to offer. Thus we considered it the best Pelican coolers with wheels. This cooler is well-built, has an easy drain plug, sturdy and durable, smooth wheels, excellent ice retention, great handle and with cup holder and bottle opener. This 80-quart elite cooler is a beast. This Pelican wheeled cooler is recommended for big events, week-long camping trips, beach trips, commercial use, fishing, picnics or job sites. The cooler has durable non-skid, rubber and raised feet. It won’t slide around in your truck bed. This is the biggest cooler in the list since it can accommodate up to 250 quarts of ice. It has a firm, strong foothold in the industry, which is the biggest in size. This Pelican Elite Cooler weighs around 80 lbs. when empty, and it weighs over 500 lbs. when full of ice and canned drinks. It can retain ice up to 15 days which makes it very helpful mainly if you are living where it is always sunny. This Pelican 250 QT Cooler is perfect during parties. Also, its design is elegant and simple and performs well. This ice box has a freezer grade gasket that holds water so that it won't leak. The Cooler offers lots of features like hinged handle system and dual molded-in, non-skid and non-marking raised feet, sloped drain, press and pull latches, and a lot more. The hardware is corrosion-resistant, with integrated fish scale on the lid and made of stainless steel. Pelican Elite is a great cooler that is popular compared to others because of several reasons. 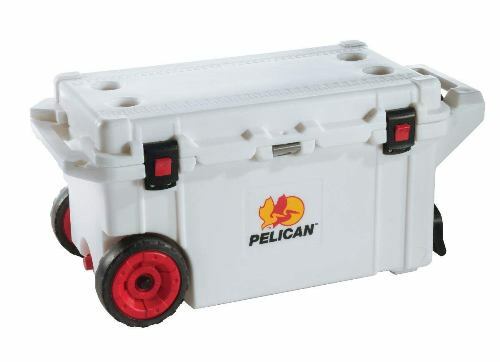 This Pelican wheeled cooler has two-inch of polyurethane insulation having a 360-degree freezer-grade gasket. It can keep your ice up to ten days. It can accommodate the internal volume of around 45-quart. It has molded-in handles and a built-in trolley handle. It is covered with anti-corrosion steel that resists any pull and drag. Just like other Pelican models it has molded handles, reinforced lockable hasp, anti-shear hinge system, stainless steel bottle opener, molded tie-down slots, and 3-inch locking latches. This Pelican has a leak-proof drain plug, non-skid rubber feet, and integrated measuring board on the lid in inches and centimeters. It includes a lifetime guarantee - if you break it, the company will replace it. 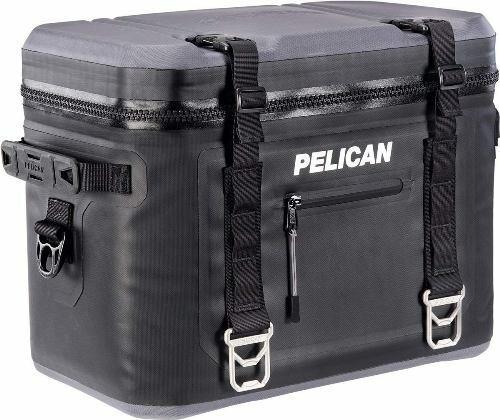 The Pelican 20 QT cooler has thick polypropylene insulation, some handy built-in features, and burly latches. It has a beefy handle and stainless steel hardware. The cooler weighs around 12.5 pounds. All Pelican products have a lifetime warranty. This Pelican can accommodate up to 15 cans. Because of its upright design, you can easily pack it into your adventure mobile. This ice cooler can keep your beers chilly for three day weekends it does not matter how hot or cold the temperature will be. One of the standout features of the Pelican Elite 20 QT is its big ABS latches. It is easy to operate and is sealed tightly inside. This feature also makes sure that nosy wildlife will not have any chance of stealing the content. If you require further protection, it has a molded lock hasp. The Pelican Elite Soft cooler has a more straightforward approach as compared to Pelican's hard-sided coolers. The company focuses on convenience, so instead of overwhelming the user with lots of features and accessories, they adhere to quality construction and excellent performance. It has 840D TPU double-coated material as its foundation. This material is very resilient to scratches, tears, and cuts and is recommended for taking into challenging outdoor elements. It is like a combination of wool and denim. The foundation of Pelican soft coolers is compression molded made of anti-slip material. It is an excellent cooler, but there are times it becomes flimsy. This base can maintain the product upright, especially when you begin to fill up with items and ice. The same material is also used on the lid of the cooler. It serves the same thing as the base does. The material is firm enough to keep it lightweight on top. This is rare for most soft-sided coolers. The soft cooler has quick-access dual-locking buckle system to keep the cover and the body impressive and tight. This works together with the zipper to make sure it is tightly sealed. This help in both retaining cold air inside and waterproofing. It also has excellent latching system. Pelican and Yeti are two popular brands of coolers. The question is which brand manufactures the best coolers. Let's find out by comparing the two based on the following - ice retention, insulation, design, size and capacities, and others. One of the reasons why Yeti and Pelican are a bit costly is because of their high-end, roto-molded coolers. Both brands can keep ice longer as compared to budget-friendly coolers. When we tested a Yeti Tundra cooler 50 QT and Pelican 50 QT cooler and placed them in a shaded area with the temperature at 70 degrees Fahrenheit, we observed that Yeti retain ice for 10 days, 4 hours only as compared to Pelican cooler that held ice for 10 days, 8 hrs. Pelican can retain ice 4 hours longer than Yeti. Pelican coolers can keep ice longer because they have thicker insulation. The Yeti designs have thick walls and 2.5-inch thick lid while the Pelican has 2.5 inch thick walls and a 3-inch thick lid. If you are more concerned on how long a cooler can retain ice, then the Pelican brand has an edge. Both Yeti and Pelican have a uni-body roto-molded design. It means that the main body of the cooler is made of one roto-molded plastic which has even thickness. This is ideal for creating a waterproof and leak-proof cooler that is resilient to shock such as dropping from helicopters, bear attacks, and others. This is part of the construction where Pelican has an advantage over Yeti. 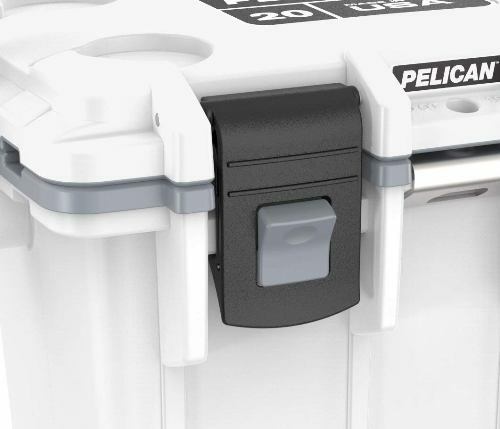 Many users have reported that Pelican latches are more superior than Yeti coolers. The rubber on Yeti models gets less rubbery over time, particularly when exposed to bad weather and sunlight. Pelican bolted-in latches will outlast the rubber latches on Yeti for several years. 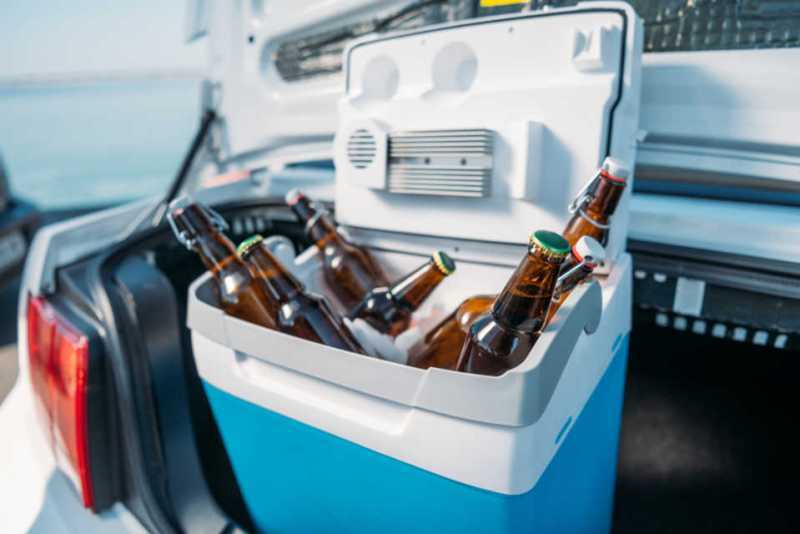 Both Yeti and Pelican coolers have a fool-proof latch, so if you have the plan to go into the bear country the contents of your cooler are safe because of their bear-proof construction. 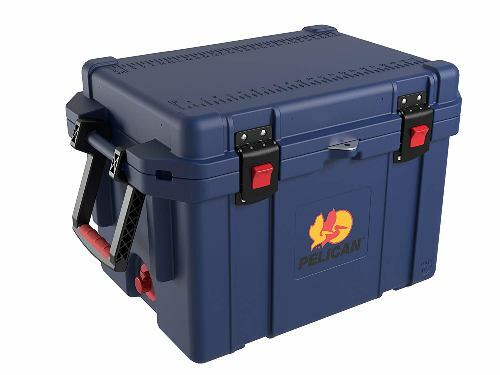 Pelican coolers will remain bear-proof even when the locking mechanism is damaged. While in Yeti coolers the bear can destroy the rubber latches using their teeth and eventually open it. The differences between Pelican and Yeti drainage plugs is worth discussing. The Pelican cooler has a one-inch drain plug attached that can double as a hose connector. But some users complain about the plug being cheap. On the other hand, the plug on the Yeti is one inch and detachable. Also, it is designed so you can turn it partially and empty the cooler slowly without detaching the plug entirely. The only drawback is that the plug is not directly connected, you can lose it. This is one feature that is not present on Yeti coolers. Fishers prefer Pelican coolers than Yeti coolers because of the measuring tape. They can easily measure their catch on the measuring tape on the lid. However, if you are more into canoeing or camping, this is not much of your concern. Check out what are the nominated coolers best used for camping. 1. 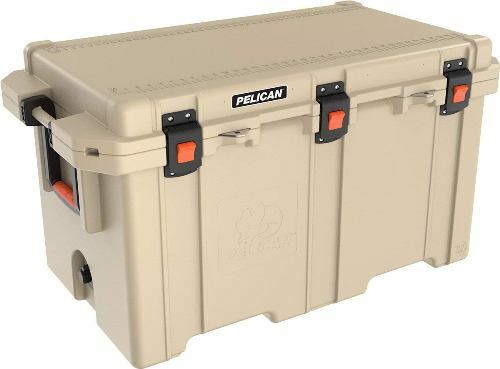 Where to Buy Pelican coolers in store? Pelican coolers can be bought on popular department stores like Walmart, Sam’s Club, Amazon or Costco. You can also find them on hardware stores like the Home Depot. Most of the time it is location dependent. Thus, many prefer to buy them online as it is much easier and more affordable. 2. 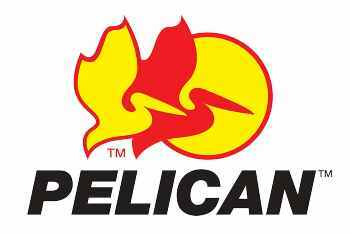 Where are Pelican coolers made? Pelican coolers are made in the USA which makes it one of the trusted brand when it comes to coolers. 3. What can I do if my Pelican drain plug is leaking? There are several ways to deal with this problem. 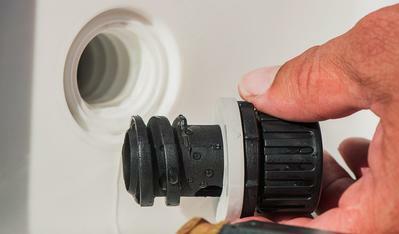 You can replace the entire drain plug assembly, reinforce the drain plug using waterproof silicone, or you can call Pelican directly and request for repair. 4. How can I make a warranty claim? You can visit the Pelican’s warranty claim center and open an account. Your call and emails will be redirected to the authorized personnel for speedy resolution. 5. What are the Pelican Elite Coolers made of? The premium class chill factor of this product is the outcome of having a 2-inch thick layer of polyurethane insulation. It does not have thin-wall sections, without cut-outs. It only has a solid, molded thermal protective layer, sealed tightly with a freezer-grade, 360-degree rubber gasket. The cooler resist corrosion because it has stainless steel hardware better than aluminum, can fight off the salt, sun exposure and sand. 6. Where are the Pelican Elite Coolers manufactured? This brand manufactures their coolers in the USA in South Deerfield, Massachusetts. They use modern equipment and materials to provide the consumers with high-quality products. This Pelican Cooler reviews revealed that Pelican ProGear Elite Cooler, 45 Quart is the best pelican cooler. This model is the best performing when it comes to ice retention. It is priced reasonably and can withstand any conditions. 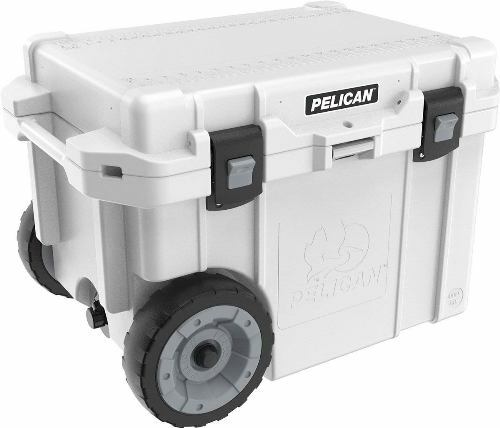 The Pelican cooler is almost similar to Yeti models, which are one of the high-priced coolers. For those, working on humid and hot environments or planning for a camping trip, this is the product to consider. 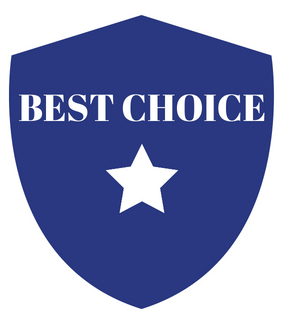 We give this Pelican cooler 4.7 out of 5 stars; you can be sure you are making the best choice. Even if you are living in hot places, this cooler can retain ice longer. If you find this post helpful to you, feel free to share this post with others.